David Tubridy scored 1-3 for Clare on Sunday. CLARE CAME WITH a late rally to dramatically preserve their Division 2 status and send Tipperary down in a cracking encounter at Semple Stadium. Colm Collins’ men went 27 minutes without scoring at one stage in the second-half with the breeze behind them but came good when it mattered most to win the day and send both Tipperary and Cork down to Division 3. Tipperary hit 1-11 from play in the opening half with the breeze and went in leading by five points thanks to a masterclass from Conor Sweeney. He hit 1-6 in the opening half, all but a point of it from play, as they went in at the break leading by 1-13 to 1-7 after an entertaining opening half. Sweeney found the net after less than two minutes and quickly added a point but Clare hit back and struck for 1-3 in seven minutes, with Gavin Cooney getting the goal after an effort for a point from Gary Brennan came back off the woodwork. Each side enjoyed periods of dominance with Sweeney hitting the next four points for Tipperary to lead by 1-5 to 1-3 after 18 minutes. Then Clare took charge again with Jamie Malone hitting a brace and Eoin Cleary and David Tubridy also scoring to go two up with eight minutes remaining in the half. Sweeney again led the Tipp revival as they reeled off six unanswered points to go four ahead and after Eoin Cleary responded for Clare, Liam McGrath and Liam Casey finished out the half well for the home side as they went in leading by five points. 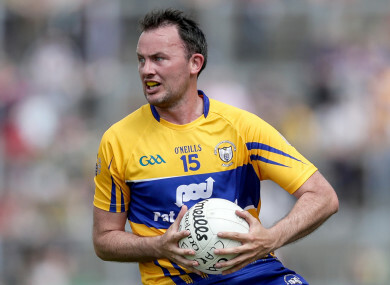 It took Clare less than seven minutes to wipe out the lead as they struck five points in a row and then Malone set up Tubridy for a goal to lead by 2-13 to 1-13 after 42 minutes. Tipperary responded with points from Liam McGrath and Sweeney to reduce the margin to a point after 47 minutes, before McGrath levelled with a free going into the final quarter at 1-16 to 2-13. Sweeney edged Tipperary back in front with a free from the right with 16 minutes left on the clock and efforts from Steven O’Brien and Sweeney pushed them a goal in front. Tipperary goalkeeper Evan Comerford produced a great save to deny Kieran Malone with four minutes remaining. But Clare finally ended 27 minutes without a score when Keelan Sexton struck in the final minute of normal time to level the match with a goal. And the Bannermen pushed on from there to preserve their Division 2 status as Gary Brennan and Tubridy landed late points to secure the win. Scorers for Tipperary: Conor Sweeney 1-9 (0-4f), Liam McGrath 0-4 (0-2f), Kevin Fahey 0-2, Steven O’Brien 0-2, Liam Casey 0-2. Scorers for Clare: David Tubridy 1-3, Gavin Cooney 1-1, Keelan Sexton 1-1, Eoin Cleary 0-4 (0-2f), Gary Brennan 0-2, Jamie Malone 0-2, Cathal O’Connor 0-1, Sean O’Donoghue 0-1. Email “Tubridy's 1-3 relegates Tipperary and Cork with Banner County preserving Division 2 status”. Feedback on “Tubridy's 1-3 relegates Tipperary and Cork with Banner County preserving Division 2 status”.